This week’s Chakra Cleansing Yoga Nidra for Inner Radiance comes to you by popular request. Of course our members get the audio download version that starts directly with the guided meditation, without any YouTube advertising or promotional preamble. This is one of the many benefits of being a member. This full length 20 min chakra cleansing yoga nidra for inner radiance will cleanse the chakras or energy portals that receive, assimilate and store your life force energy. When we are healthy our life force energy flows smoothly, but it can get blocked and we can experience a lack of life force energy or a surge of life force energy that feels overwhelming. There is an ebb and flow to our life force energy that is natural. In the morning we will have more energy and this allows us to wake up and get on with our day. In the evenings we slow down which allows us to sleep through the night and restore our energy for the next day. In this yoga nidra we will balance the life force energy that flows through the chakra energy system in your body providing you with a radiance and brilliance that allows you to glow from the inside out. 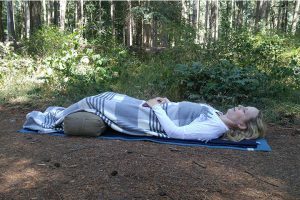 Through this yoga nidra we will access the life force energy that runs from the base chakra to the crown chakra allowing us to release fixed patterns and emotions hard-wired into our tense body armouring. The seven chakras that we will cleanse in our guided yoga nidra energy meditation today are a powerful gateway into our inner psychology. Support from our Bookclub, Moonstruck and Devotional forums as well.